Rotterdam, 13th September 2016 – Hamburg construction company HC Hageman announced today that MVRDV has won the masterplan competition of Hamburg Innovation Port, a new 70.000m2 development in Channel Hamburg, the Hanse City’s southern high-tech hub. 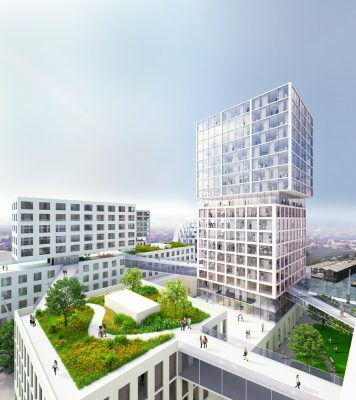 The project connects existing port typologies with urban dynamic and architectural diversity to realise a strong identity and innovation on the site. One existing hall is absorbed into the composition. 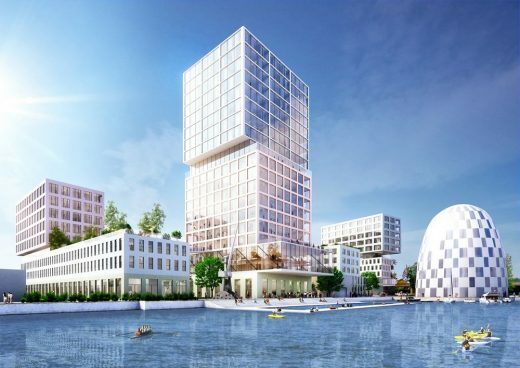 The site is at the waterways of old Harburger Schloss in the so-called Channel Hamburg development, the southern high-tech hub of Germany’s most northern metropolis, which is currently nearing its final stage of realisation. The masterplan foresees a total surface of 70,000m2 of which 6,300m2 hotels, 5,400m2 conference halls, 26,000m2 offices and start-ups, 9,600m2 laboratories, 7,100m2 research facilities and 7,800m2 parking. 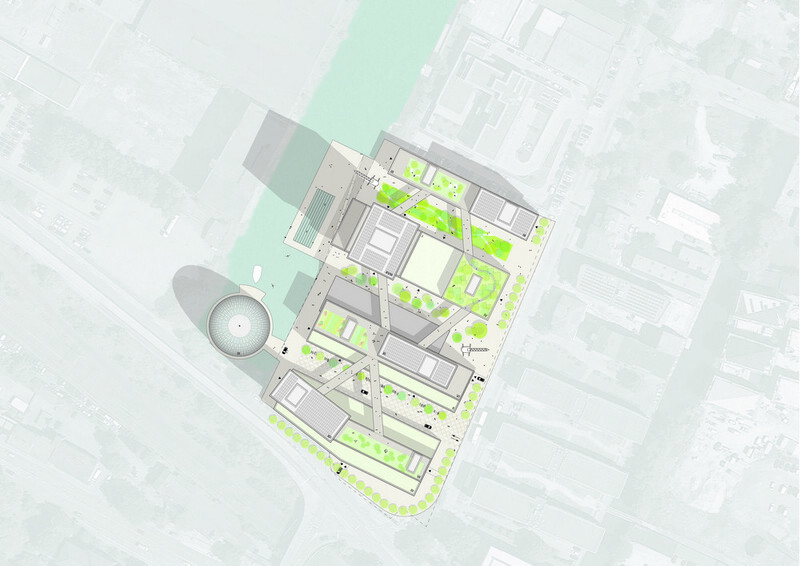 The plan offers through its 1,35m grid enough flexibility to change the programme along its realisation and allows enterprises of all sizes to occupy the various buildings. The basis of the urban plan are alleys between the street and harbour basin. The plinth in up to three storeys follows this harbour typology. The next layers are floors suitable for laboratories and larger office spaces. The higher points of the plan offer room for light and flexible offices, in the centre of the building’s volumes are space for special programme including restaurants, canteens or libraries. The roofs are partly green and partly used for terraces and solar cells. In a later stage the roofs and some of the buildings will be connected via bridges. The bridges are flexible and can be adapted to the users, in this way horizontal, large surface offices can be created. Parking is solved underneath each building and accessible through one communal entrance. An existing hall on site will be transformed and be used for temporary activities on site or to support the construction of the other phases. 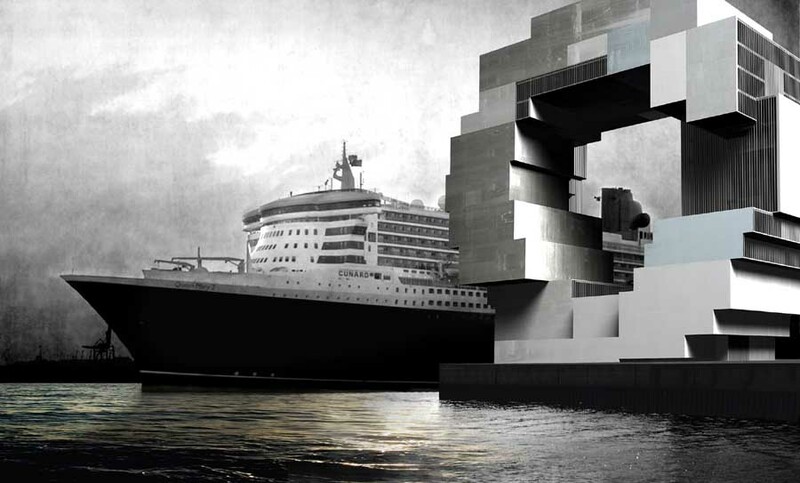 The fifth building is a hotel that is proposed to float in the port and accessible via a jetty. Part of the plan is the idea of a diverse public space in which each part has its own strong character. There is a park, a boulevard, a square, shared spaces and a waterside promenade featuring wide stairs towards the water that invite the office workers to have outside meetings and al fresco luncheons. MVRDV proposed a dense and programmatic mixed urban plan that would guarantee a lively new urban area. A special focus is the diversity of the project, both in an aesthetical and typological manner. The phasing strategy makes it possible to realise Hamburg Innovation Port in different portions, to commission different architects for the buildings and to change the project as in the coming years the program might change. This flexibility is an essential characteristic, each of the five buildings can be realised on its own. 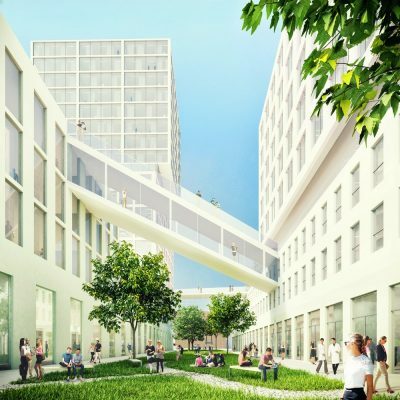 MVRDV designed the Hamburg Innovation Port master plan together with co-architect morePlatz from Berlin for HC Hagemann, one of Germany’s oldest construction companies with a tradition and history dating back to 1869. Hadi Teherani Architects are also selected to build one of the architectural projects. The total budget is approx. 150million euros. For MVRDV, this project is the first successful competition in Hamburg after the office had tried earlier to secure amongst others Hafencity University, Überseequartier Offices, Unilever Germany, City Nord and Strandkai Housing. Size & Programme: A total surface of 70,000m2 of which 6,300m2 hotels, 5,400m2 conference halls, 26,000m2 offices and start-ups, 9,600m2 laboratories, 7,100m2 research facilities and 7,800m2 parking. 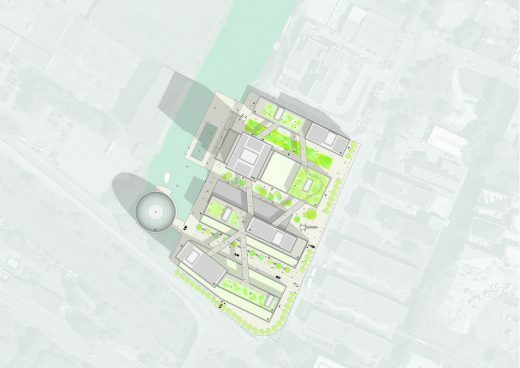 The plan offers through its 1,35m grid enough flexibility to change the programme along its realisation and allows enterprises of all sizes to occupy the various buildings.